Why did I add neosauropod-esque dorsal spines? Because I can. Such is the dark power of the unsupervised paleoartist. I must admit, I am particularly impressed by the animal's relatively short, but sizable forelimbs and very deep tail. Thanks for taking a go at a life restoration of Aardonyx. I had always meant to do one myself but never found the time and then the release came up so quickly. Interesting factoid about the spines - we did find a small number (three) of osteoderms in the quarry. We don't know what they belong to, they don't look like thyreophoran or crocodilomorph scutes, maybe they come from Aardonyx but then I would have expected to have found more. Nice. Though I would have given the critter inflated nasal sacs similar to the Luis V. Rey restoration of Muttaburrasaurus. I wonder if the fact that this animal was a facultive quadruped (perhaps getting down on all fours to eat, like a kangaroo), means that the idea that basal sauropods were all bipedal or all quadrupedal is not so cut and dry. 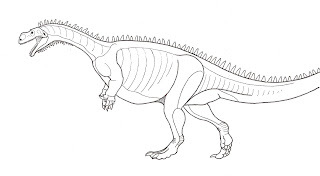 Perhaps some were fully bipedal, like Plateosaurus, others were fully quadrupedal, like Melanorosaurus or Riojasaurus, and others were somewhere in the middle, like this guy. Of course, Aardonyx is a non-prosauropod sauropodimorph, so perhaps the basal sauropod-like clade...thingy (you know the one I'm talking about, the one where Anchisaurus and Melanorosaurus got reassigned, as well as Aardonyx is a part of) were all facultive quadrupeds, getting steadily more quadrupedal as one gets closer to the true Sauropoda.